As I was scouring the internet looking for inspiration for this tree, I came across an image from an old Women’s Day magazine posted on a tumbler page. The second I saw it the whole tree coalesced in my head. Before that old magazine article I knew I had a bunch of vintage ideas floating around my brain, but “vintage” pretty much includes all of time, so I needed to narrow that down a bit. Going down the tumbler rabbit hole I knew the time period I was going for and how I was going to get there. It was only after I made the ornaments that I noticed the magazine article was from the 70’s, not the late 50’s early 60’s I was going for, but I don’t care. I knew that I needed just a touch of modernity to make this tree interesting and these mod inspired ornaments are just the thing to make it unique. I turned the image black and white and printed it out because I knew I pretty much wanted to make my ornaments as close to the inspiration as possible. If you want to do the same, just scroll down. I included it for you. I used the print out as a template and cut the shapes out of fun foam. Fun foam is a favorite material of mine for ornaments because it’s cheap, durable, and cuts super easy. Then decorate your ornament. I wanted a 3 D look so I used Gallery Glass – a faux stained glass style paint. Dripping little dollops of paint made beautiful dome shapes once they dried, but it does take overnight to dry. I had to work in layers, back to front, letting each layer dry before adding the next layer of dots and embellishments. Just keep going until you get the look you want. You could use a ton of paint mediums to decorate these, and if you’re making them with kids you could even just use stickers. To attach a hanger thread a needle with some yarn or thick thread and poke the needle right through the foam, tying the two ends together to make a loop. Here’s the original source of inspiration. 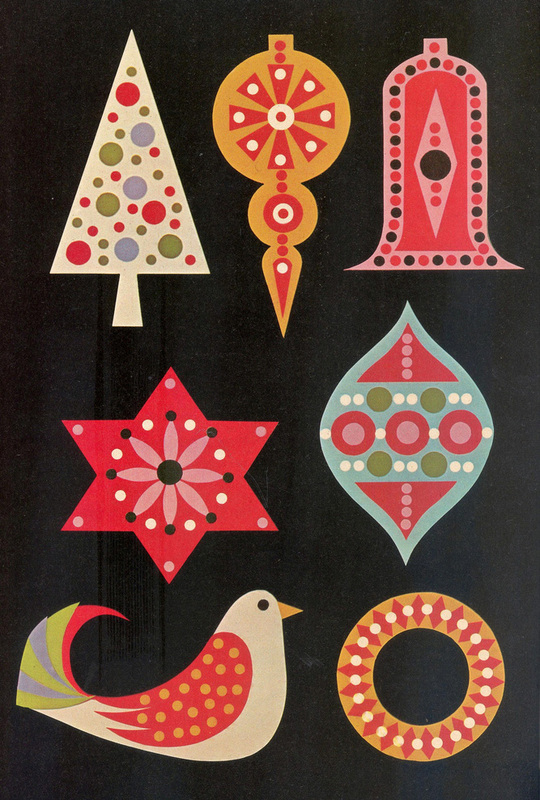 Found at Mid-Century Modern Graphic Design. Click on the image to get to full size or this link to get to the source. The gallery glass dries a bit sticky so you’ll have to take some care when storing them. You don’t want them to just stick together in one giant ornament for next year. But I think it’s worth it to get that unique shiny look. It takes it from silly old fun foam to something modern and special.